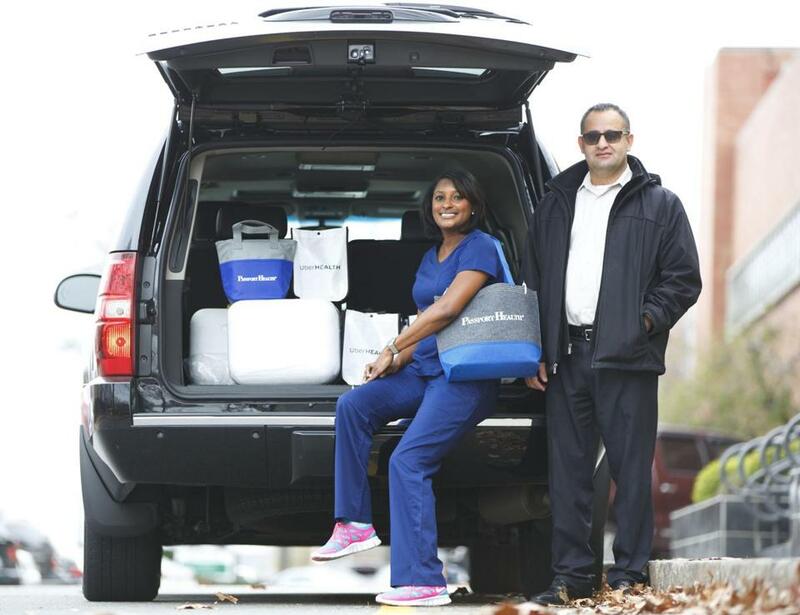 Uber driver Sahin Kaya, of Melrose, drove nurse Shacuiya Lang, of Brockton, around the Boston area so she could administer flu vaccines. For four hours Thursday, people in Boston and 35 other cities had the opportunity to summon a nurse to their doorstep to give them a flu shot. This experiment in “on-demand health care,” which involved the use of hundreds of Uber drivers, heralds what some consider the wave of the future: bringing health care to the people, instead of waiting for them to come and get it. The project, dubbed UberHEALTH, was the brainchild of John S. Brownstein, a researcher at Boston Children’s Hospital and Harvard Medical School who develops technologies that track and promote public health. “The concept of bringing on-demand services . . . bringing physicians and nurses to people has so many opportunities,” Brownstein said. Startup companies are enabling people to order home visits from medical professionals, he said. For example, PediaQ , available in four Texas communities, provides an app parents can use to summon a pediatric nurse practitioner to their homes during evenings and weekends. The Uber project is an outgrowth of Brownstein’s HealthMap Vaccine Finder, a website that provides a list of recommended vaccines, tailored to the individual, and locations nearby where the vaccine can be obtained. But no matter how easy it gets, most healthy young adults can’t be bothered getting a flu shot, with only 30 percent of 18- to 49-year-olds getting vaccinated. That’s why Brownstein said he contacted Uber, the ride-hailing service, last year with what might have been regarded as a wacky idea: How about inviting people to call Uber drivers who have a nurse and box of flu vaccines in the back seat? Lang held one of the influenze vaccination kits that she used to vaccinate patients. Uber, he said, was receptive from the start, and tested the program in Boston, Chicago, New York, and Washington, D.C., last year. The demand proved greater than the supply of vaccine, and many customers were disappointed, Brownstein said. Still, more than 2,000 got vaccinated in that 2014 pilot. In a survey afterward, 78 percent of respondents said having the vaccine delivered was important to their decision to get the shot. On Thursday, Uber expanded the one-day flu-shot program to 36 cities, including Philadelphia, Houston, Des Moines, and Los Angeles, where the service was available from 11 a.m to 3 p.m. Thursday. It was offered only for a short time because of limited resources and the need to gauge patient demand, Brownstein said. Uber declined to say whether it would offer the service again. Dr. Anita Barry, director of the Infectious Disease Bureau at the Boston Public Health Commission, welcomed the Uber project to Boston. 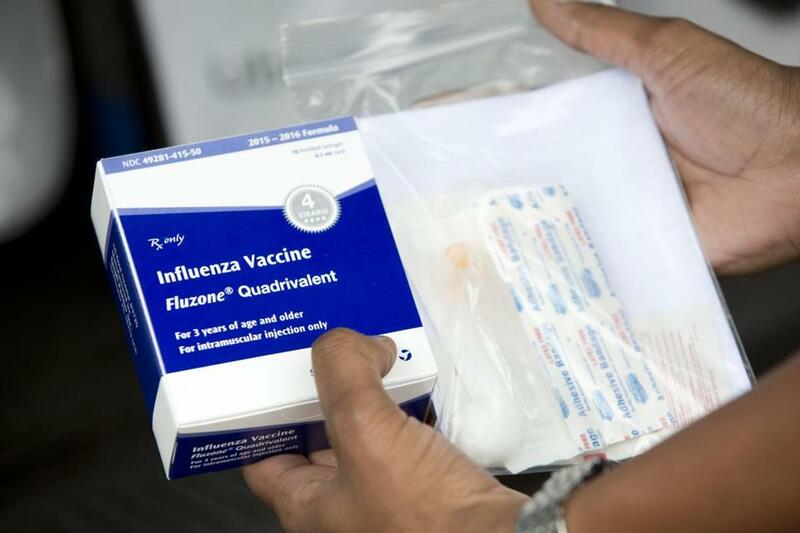 “The more people we get vaccinated against influenza, the better off we all are,” she said. The “wellness pack” is a bag with trinkets such as hand sanitizer and a water bottle. When someone clicked to order it, the driver receiving the request gave the information to a nurse, who called to confirm the request and ask if the customer also wanted a flu shot. Upon arrival, the driver waited in the car, while the nurse went inside to handle paperwork and administer the shot at no additional charge. Up to 10 people could be vaccinated at each site; workplaces were among the sites visited. The nurses were employees of Passport Health , a national company that specializes in running immunization clinics and providing vaccines. Epidemico , a public health data-mining company that Brownstein helped found, bought the vaccines and shared the operational costs with Uber.